The behaviour change that you observed in your daughter is known to autism researchers. It has been investigated in a few studies, two of which are described in the links below. But we still don’t know how common this behaviour change during fever is in children with autism. We also don’t know the reason why it occurs, even though there has been some discussion in the scientific literature about it. One of the studies on this topic was completed in the US and confirms your observations, albeit with a relatively small group of children. The study was published in the medical journal, Pediatrics, in 2007. Below is a summary of the study, published on the website of Autism Speaks. (See also the link at the end of this document). In 2009 another study was published in the scientific journal Brain Research Reviews that was summarised on the website of the Autism Support Network in the US. And here is the link to the complete paper. The authors suggest an explanation that autistic behaviours may be an outcome of malfunction in the LC-NA system of the brain stem, which improves during fever episodes. We wish to emphasize that this is only a theory at this stage and that further research needs to be undertaken before this theory can be verified. There is general agreement amongst researchers and practitioners that in the majority of cases, we do not know what causes autism and how it can be prevented. It is widely understood that there are many causes of autism and therefore there need to multiple treatments. We do know however that behaviourally based early intervention can significantly improve symptoms and behaviour. The theory proposed in the above paper is one of many and should not be taken as the simple truth. Also see an article in the US journal Time, which also emphasises the points just made. I am the proud parent of a six year old verbal autistic boy and have found the opposite reaction. When ill ( especially with fever) he withdraws and stops talking for days. He won’t eat or drink and will not look at me or communicate at all. I have had to take him to hospital due to dehydration and spent hours trying to convince doctors that he is verbal and has high functioning autism. thank you for your comments on our article. Your comment confirms a common finding that different children with ASD often have different reactions to events in their environment, in this case fever. ASD describes such a complex spectrum of disorders, and it’s not surprising that individual differences are also complex and significant. 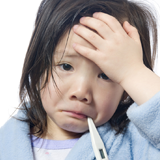 Our article on reactions to fever was written in response to a question from a parent whose child reacted to a fever in a specific way and wanted to know if there is any research on this phenomenon. Our search of the literature confirmed that similar reactions had been recorded to have happened to other children with ASD. But as we say in our article, we don’t know how common these particular reactions are and why they occur. We may have added that we don’t know whether there are other reactions to fever experienced by children with an ASD and whether they are different to those experienced by typically developing children. We need more research on this issue. Having said this we must emphasise that any child with a fever will need the standard medical treatment and must be monitored for complications.